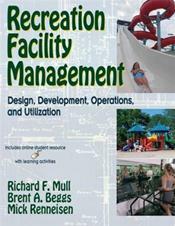 Recreation facility management is a complex responsibility. Professionals in this field are responsible for various types of facilities.recreation centers, water parks and pools, playgrounds, parks, fitness centers, sport complexes, and resorts.each with its own set of goals and challenges. Recreation Facility Management: Design, Development, Operations, and Utilization provides students and new professionals with a basic understanding of recreation facilities and prepares them to perform the duties required of a recreation facility manager.